With spring finally here and Easter almost upon us, it seemed a good time to write about chicken and egg. The signs of spring are everywhere. To date there are half a dozen Longhorn calves born. You’ll see them alternately frolicking and snoozing in huddles in the fields along the drive to the Steading. It really does feel like things are warming up and you can finally see the yellow tips of the daffodils starting to peek out over their long green stems. New life is happening all around us. And the chickens are really and truly laying again. Spring has sprung! But I digress.. 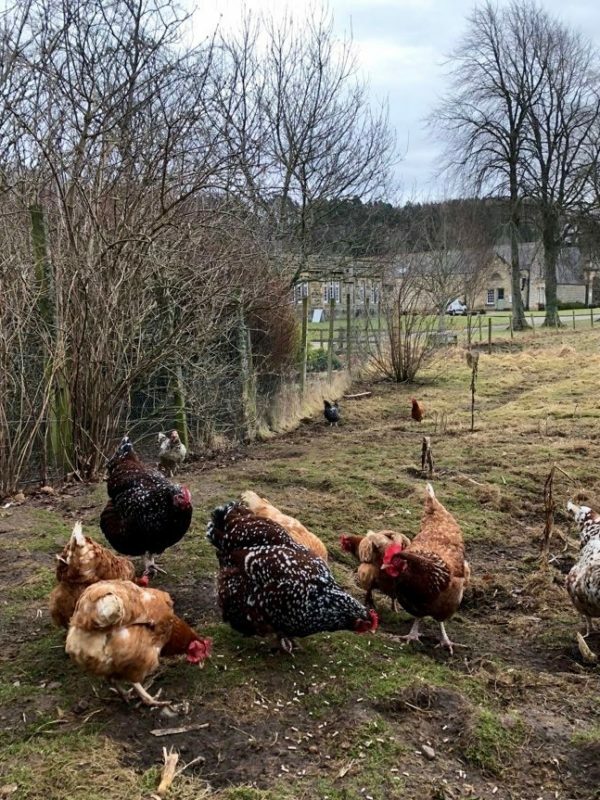 Some of the eggs that we sell in the Farm & Garden Shop are laid by the free range hens here at Logie – to the left of the road as you walk towards the garden. The small pure red-brown hens are Hy-line Brown, a hybrid that has the potential to lay 320 large brown eggs by 74 weeks of age.  The larger, dark brown speckled hens, and the splendid cockerel, are an old breed, Speckled Sussex. Originally from the south of England, it is one of the oldest known breeds – there is evidence that the Romans found a similar breed when they invaded over 2000 years ago. For that reason it is known as a Heritage breed. These pure bred hens are good egg layers (but not as prolific as the Hy-line Browns) laying four or five light brown eggs a week. 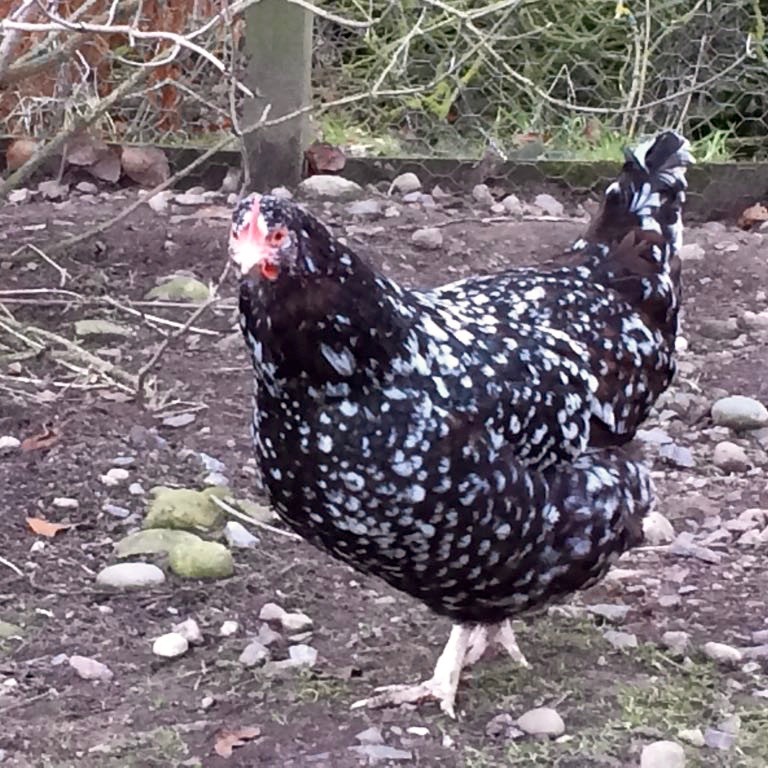 The ‘in between’ coloured hens – mostly showing the speckles but not with the dark brown colour, are crosses between the Speckled Sussex and the Hy-line Brown. Because the Hy-line is already a hybrid, the resulting crosses come out in a variety of different colours! While pure and cross bred birds are popular for their distinctive appearance, they do not lay as well as the specially bred hybrids, which are bred to produce large numbers of eggs. Unless you are a chicken-keeper, you may have thought that ‘eggs is eggs’, or possibly not given eggs too much thought at all. Although after Panny’s explanation of the variations in her two types of hens alone, you might wonder if there are variations in eggs too. And you’d be right. Firstly there’s the look of eggs from different types of chickens – from tiny to large, dark brown to palest greeny-blue and all sorts in between. Then there’s the taste. I don’t know much about the difference in taste between breeds (is there any? perhaps someone can tell me?) but if you’ve tried some genuinely outdoor free range eggs you might – like me – feel that in taste there’s all the difference in the world. Comments Off on Eggs is Eggs?